The university classroom is, when operated properly, a crucible in which great ideas are forged. For hundreds of years, young people have counted upon the university system to feed them information about the world, but also to challenge their malleable understanding of the world. Aside from the obvious (facts, mathematical formulae and the like), it is a teacher’s job to help a student learn how to think, not what to think. Unfortunately, the authoritarian left has not adhered to the time-tested purpose of the university in quite some time. Saida Grundy is an “incoming Assistant Professor of Sociology and African-American Studies at Boston University.” As you might expect for someone who secures a position at such a prestigious university, she has some prestigious publications and likely has many colleagues and students in her corner. As you surely expected, there is more to the story. 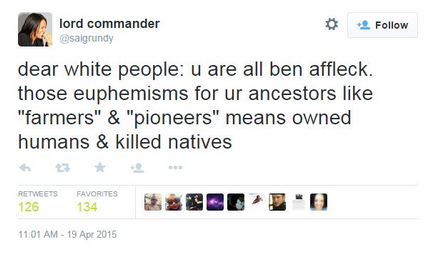 It seems that Ms. Grundy is fond of the concepts that underpin the authoritarian left’s opinions on race and gender. As I make clear on this outlet, people are more than welcome to say whatever they like, short of slander and the incitement of violence. I’m not particularly fond of the dogpile-someone-because-of-their-off-the-cuff-comments game that so dominates our discourse. Instead of merely pointing out some of Ms. Grundy’s outrageous and problematic statements, I am asking Ms. Grundy–should she ever read this–if she thinks that she is able to conduct her classroom properly. Does she really believe that she provides her students with the opportunity to explore new ideas? Does she empower them to make mistakes along the way to personal enlightenment? Most of all, does she make some of her students and their thoughts feel excessively unwelcome? To repeat myself: Ms. Grundy’s statements (there are plenty of others) are not necessarily outrageous enough for me to advocate her dismissal from BU. To repeat myself again: universities are the places where, by definition, you must come into ideas that run counter to your own and may seem inflammatory. Mere espousal of such beliefs are not necessarily a problem; the problem occurs if the teacher prevents the ideas from being questioned. It is unacceptable if students are deprived the right of honing their intellects in the fire of genuine scrutiny. Does Ms. Grundy foster a sense of free collaboration in her classes? Does she ensure that all of her students, regardless of race and gender, feel safe to participate in important discussions? Can her students share ideas without fear of reprisal? It’s not as though Ms. Grundy is a professor of mathematics and her apparent prejudices are unlikely to manifest themselves in class. She will teach Sociology and African-American Studies classes, most of which, I’ll wager, will contain students who are in her class to fulfill a gen ed requirement. Will these kinds of students feel comfortable taking issue with Ms. Grundy’s beliefs with regard to the subject of the class? 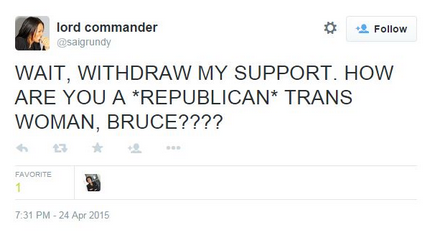 Ms. Grundy seems not only to be doing a disservice to those “unarmed combatants” in the conflict, so to speak. If you work toward a degree in Ms. Grundy’s department, are you doing real research? Are you exploring new ideas? Or are you merely parroting hers, never questioning authoritarian left orthodoxy? And if you are merely repeating after her, what’s the point of going to college in the first place? Why not simply watch a lecture on YouTube enough times to memorize it? I regret that my personal passion about issues surrounding these events led me to speak about them indelicately. I deprived them of the nuance and complexity that such subjects always deserve. One hopes that Ms. Grundy remembers the feeling that led her to type those words the next time she sets foot in a classroom. For there will, no doubt, be some of those “problematic” white college males around. 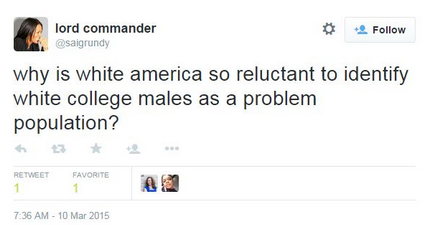 Those white college males may have ideas and make statements with which she disagrees. Perhaps she will treat those who disagree with her with the “nuance and complexity” that human beings deserve.